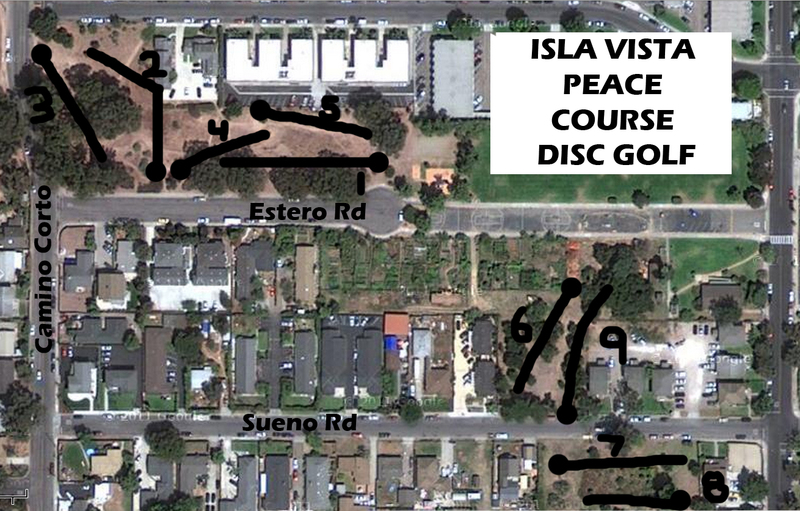 Short course located in the college town of Isla Vista. The first five holes are in the newly renovated Estero Park on Estero Rd. #6 is down the park, next to the Community Gardens. Cross the street to holes #7 and 8, and go back across the street to finish up at #9. A round can be finished in less than an hour. From Hwy 101, exit Storke Rd., south toward ocean/UCSB, across Hollister, left on El Colegio at 3-way, right at 1st light (Camino Corto), left on Estero, #1 is at the end of the road. Might be a 2 rating if you are living or hanging out in IV - but Evergreen is too close for this to rate more than a 1 or 1.5 rating for the rest of us. take what you can get. 9 holes in between apartment buildings and around a small public park. it's better than NOT playing.